Commercial dog food has changed considerably over the years. When I trained my Labs for field trial competition in the 1990’s, there were only a few high performance brands available and it was easy to find the best food to match the performance requirements of my dogs. Fast-forward to 2017 and the diversity of brands and range in quality of commercial kibble available on today’s pet food market is mind-boggling. How do you choose the best kibble for your pet? Interpreting the information provided on pet food package labels can be daunting. Price is not always the best indicator of nutritional quality. Online resources such as www.dogfoodadvisor.com provide unbiased analyses and ranking of kibble and canned foods for all life stages. You may find it useful to look up the food that you are currently feeding and learn why it is ranked at a certain level. Your goal should be to provide a food that is ranked at four stars or higher to provide the best available nutrition for your pet. If you are like me, and want to learn for yourself what the pet food industry is all about, there are several online courses available. I recently completed an online certification with a program through Dogs Naturally Magazine (www.dogsnaturallymagazine.com). This certification has enabled me to confidently provide more informed nutritional advice to my students. In this and following issues I will provide a simplified summary to enable you to ask informed questions to your pet food providers and to make informed nutritional choices for your pet. This series is intended to provide facts about kibble. It is not intended to debate or compare the pros and cons of feeding commercially manufactured foods (kibble and canned) vs raw food. In this issue you will learn some facts about commercially manufactured foods including pet food regulation, packaging and labels, specifically who is looking after the food safety of your pets and what pet food manufacturers are required to list on the package. The answers may surprise you. PET FOOD REGULATION: AAFCO (Association of American Feed Control Officers) is comprised of members from the pet profession and the commercial pet food industry (PFI). Their role is to set standards for pet food content and to provide recommended guidelines for required nutrient level and feeding directions. The Canadian Veterinarian Medical Association (CVMA) closely monitored pet food quality and standards in Canada up until 2007 when it was replaced by AAFCO. The CVMA endorsement label is not permitted on pet foods exported to the US. The U.S. Federal Department of Agriculture (FDA) monitors food branding, ingredient safety and health claims. 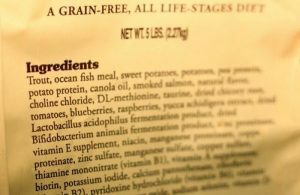 The FDA relies on ingredients that are “generally recognized as safe” (GRAS) to support monitoring and to validate claims.. Under AAFCO regulations a company has up to six months to change package labels (Ingredients List and Guaranteed Analysis) AFTER changing the formula. So … although the label on the food may look the same as what your dog always loved, a legal unannounced and unpublished change in ingredients and Guaranteed Analysis could explain why he/she develops challenges or medical issues with food that they once enjoyed. AAFCO regulates words that can be used for product names, ingredient description and marketing purposes. The words ‘human grade ingredients’ can be used in marketing but are prohibited on pet food package labels. The name ‘Prescription Diet’ is a brand name used for marketing purposes and has absolutely nothing to do with medical or therapeutic value. The next time your vet recommends a ‘prescription diet’ for your pet, do some homework before purchasing the food. Ask your vet what ingredients are unique and why they make that food absolutely essential for your pet’s health. Go to www.dogfoodadvisor.com for the food’s analysis and ranking. There is a good chance that you can purchase a better quality food at your local pet food retailer at a lower price. 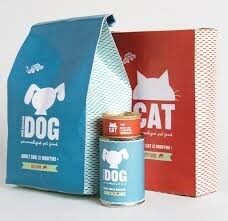 PET FOOD PACKAGING: When it comes to packaging, pet food manufacturers pay close attention to consumer trends. While pet food packages are intended to protect the food, the industry devotes a significant portion of their marketing budget to packaging in an effort to leverage what you want for your pet. To protect freshness and to maintain the quality of the antioxidants, once the bag is opened, some manufacturers provide re-sealable tops on their food bags. Modern packages also contain grease barriers to protect against oxidation of fats. Oxidation changes food chemistry, and increases risk of mold, bacteria and other health risks. Transferring your pet’s food from the manufacturer’s specially composed bag, into a plastic bin, compromises the food’s freshness, nutritional quality and chemical composition. Food will go rancid when exposed to air, and when interacting with the sides of a plastic container. If you already have a plastic bin for your dog’s food, leave the food in the bag; seal the bag tightly after opening and place it in the bin for storage to protect the bag from tears or dampness. a). BEST BEFORE DATE AAFCO requires a Best Before Date to be listed on every bag or canned food. The Best Before Date indicates the shelf life of the product, or the date by which the food must be sold or removed from the shelf. It does not reflect when the food was manufactured, nor is it an indicator of freshness at packaging or how long the food will stay fresh once the bag is opened. Once a bag of kibble is opened, deterioration occurs within six weeks. In reality, beef or red-meat- based kibble should be used within three weeks of opening and chicken or white-meat-based foods should be used within two weeks of opening. Canned foods should be used within three days to provide optimum nutritional value for your pet. You won’t find that information anywhere on your pet’s food package! b). The Display Panel: The ‘Display Panel’ of your pet’s food package is the eye catching, colourful front of the bag or can that faces the aisle – i.e. the location that is most likely to catch your eye. Research confirms that people make purchases for pets (and many other products) based on emotion. Glossy display panels showing wholesome ingredients such as fresh salmon, or juicy steaks that appear ready for your barbeque, and vegetables that appear to be fresh picked from the garden, leave you with the impression that the meat and vegetable ingredients that went into making the pet food, could also be fed to your two-legged family. In reality, and within current AAFCO regulations, the front panel is designed for marketing the product and is not required to reflect the actual ingredients in the food. c). The information Panel provides the details about food ingredients and percent content. The information panel is usually a white panel with black type or some other colour combination that blends with the background colour of the bag. It is located on the side or back of the food package, not in obvious view as you cruise down the aisle. Once you are attracted to the flashy display panel on the front of the bag it is important to actually read the information panel to learn more about ingredients. In our next issue we will discuss the components of the information panel and why it may be the most important and the most misleading component of the pet food industry.